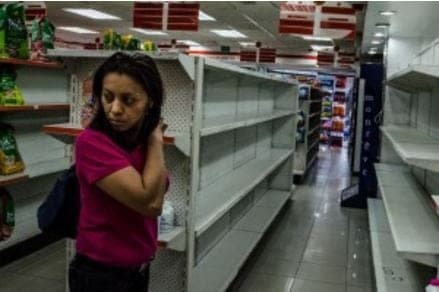 June 9, 2015 – As Venezuela’s citizens scrounge for food, with hundreds desperately waiting in long lines only to reach empty store shelves, the Maduro government was recognized yesterday by the United Nations Food and Agriculture Organization (FAO) for “meeting the UN millennium goal of halving malnutrition,” according to Venezuelan news reports. According to a January report in the New York Times, Venezuelans are herded “like cattle,” standing for hours in a line of more than 1,500 people hoping to buy food, as soldiers with side arms check identification cards to make sure no one tries to buy basic items more than once or twice a week. At the UN yesterday, however, Bolivarian Vice-President Jorge Arreaza “highlighted his nation’s achievements in eradicating hunger under the socialist governments of Hugo Chavez and Nicolas Maduro.” Video. Venezuela was also honored for allegedly providing technical assistance to other nations striving to meet millennium targets for eradicating hunger. “Venezuela can be considered one of the countries, like Brazil and China, that has contributed to South-South cooperation in the world,” noted Laurent Thomas, FAO Director for Technical Cooperation.